You must be a member of the Jakarta Fun Activities & Sports Group to attend this activity. Would you like to join this group? This Project Proposes a combination of French Songs from great composers , such as : Barbara, Serge Gainsborg, Jacques Prevert and Joseph Kosma, Charles Trenet and some original composition inluding French Lyrics. 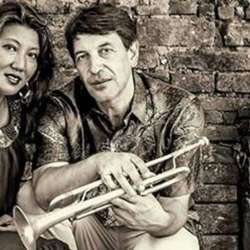 The Colaboration between the 2 artists Jean Sebastien Simonovies( France) and Nita Aartsen ( Indonesia)started 3 years ago after They meet in the Asean Jazz Festival in Thailand. Ever Since the 2 partners toured and performed in a lot of different countries such as : spain,Portugal , Belgium, Holand , France , Germany, Australia, Indonesia, Vietnam, Singapore, Italy. A lot of experimentations between Jazz, Latin , Traditional Indonesian Music Fused with French Original compositions Have been made which gives to the duet an very large range of colors and a singular originality.